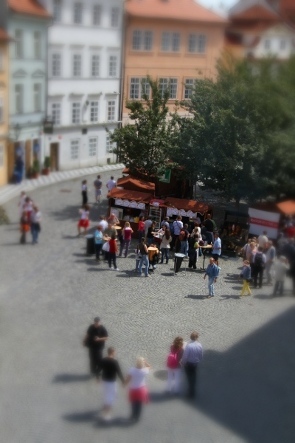 Selective focus tilt/shift photographs can create an amazing toytown feel to them. I’ve used a lensbaby composer to similar effect, for example in my photo set Toytown, but the true master of the art in my opinion is Olivio Barbieri, whose work is truly stonking. Well, the thing is that if you're like me you don't always have your trusty lensbaby with you, right? So you gotta fake it. I figured out one way to fake a selective focus using The GIMP, so I made this short howto video for people who want to do the same. My approach was simply to select the region I want to focus on, invert and feather my selection and blur. I used gaussian blur (because its fast!) to save myself some editing down the line. But you could use whatever. Of course, it was only after I’d done battle with kdenlive to make the video, that I thought I should search to see if anyone had done this before and found that, disappointingly, I was not the first. Michael Scott has done an excellent writeup of a damn near identical technique for the more literary-minded of you who don't get on as well with video. Ah, well, the more the merrier I guess. Finally, here are my before and after pics. Oh by the way, this is Kampa island in Prague. Shots from above seem to work better with this technique. I’d love someone to explain why! I've also linked your site and video on the tilt-shift tutorial page!